I’m not sure if the designers really had this in mind, but the “each player” phrasing says to me that you could choose yourself as a foe if you wanted to. I don’t know why you would, as it seems like there might be easier ways to sacrifice your own creatures for value, but it might come up one day. 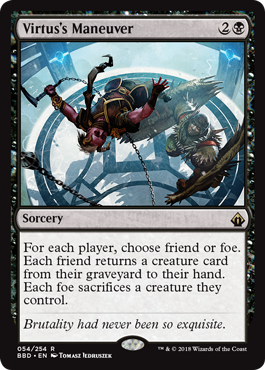 As far as Battlebond‘s own Two-Headed Giant gameplay goes, this is basically card advantage on a crazy scale – I don’t know if anybody ever found Cruel Edict effects to be exactly bad in multiplayer, but this takes it to a crazy scale. Thinning out opposing creatures and getting back your team’s best creatures seems like a bargain for three mana. Oh, and it’s a political tool in EDH, too. Crazy! Cruel Edict and Recover stapled to the same card, without targeting? More likely than you think. Virtus’s Maneuver is one of the “friend or foe” cards that scales pretty well to both 1v1 and more player-heavy games, offering either politics or simple advantage. It’s not the flashiest or most-explosive rare of alllll tiiiiime, but it’s solid removal, late game gas when you need it, and well above the rate of return. And a sacrifice outlet for you as well, I suppose, but who cares about that. Also, keep in mind that for this spell, and the rest of this cycle, you do not need to reveal who you plan to designate as friend or foe until after the spell resolves. This can maybe give you the ability to tool your plan in a way that best suits you.